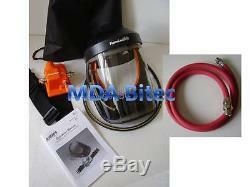 Devilbiss Finishline Vizi Air-fed Mask & Spray Gun Hose. Delivered Monday to Friday Only. Deliveries Monday to Friday Only. All orders received Monday to Friday before 12:00pm will be dispatched the same day EXC UK BANK HOLIDAYS. Devilbiss Finishline VIZI-60 Air Fed Mask. Extra Hose to Connect Tool. Devilbiss Finishline'Vizi' Air-Fed Visor Cost effective respiratory protection for automotive refinishers The new Devilbiss Finishline'Vizi' Air-fed visor offers the very best in continous and controlled breathing air respiration, in a lightweight, comfortable package that provides superb respiratory protection and excellent vision, through the deep and wide angled flip-up facepiece. As a Class 3 system, the finishline Air-fed Visor is specifically designed for busy painters and features a low pressure warning whistle should the inlet pressure fall below the recommended level, which is particularly important when using automotive refinish paints containing Isocynates. Lightweight and adjustable visor headpiece Controlled air-flow - keeps the operator safe and cool Preset waistbelt air pressure regulator Tear off disposable visor covers for optimum visibility Low pressure warning whistle to comply with the latest H&S regulations Quick release of headpiece air supply hose Suitable for use with all paints, including those containing Isocynates Nominal protection factor 200 (class 3) CE marked for European use, approved to BS EN1835:2000 Robust, enclosed regulator housing, keeps controls free from dust, dirt and overspray Supplied with a strong nylon, drawstring, storage bag & 2 tear-off visor covers Also comes with a 1.2m Devilbiss spray gun hose. This product may contain hazardous materials and therefore appropriate personal protective equipment should always be used. A Health & Safety data sheet is available on request, please messgae us and will forward a copy to you. Technical data sheets are also available for most products listed, please messgae us with your requirements. This directive, known as the PPD, states that some paints cannot be marketed if they contain more than a specified amount of organic solvent. These are mainly decorative paints and varnishes, and products used in the repair of vehicles. Therefore it is against the law to use non-compliant solvent based paints and materials for the refinishing of passenger vehicles, unless the vehicle is classified as vintage or classic. This is supplied for industrial use only and in purchasing this product you acknowledge that you understand the implications regarding its use. Monday Tuesday Wednesday Thursday Friday. Google: Bitec Paint and Refinish Supplies. The item "Devilbiss Finishline Vizi Air-fed Mask & Spray Gun Hose" is in sale since Monday, November 27, 2017. This item is in the category "Vehicle Parts & Accessories\Garage Equipment & Tools\Paints & Supplies\Other Body Paint & Supplies". The seller is "mdabitec" and is located in Telford.